Hi, I’m Kathleen, and I’m new here. 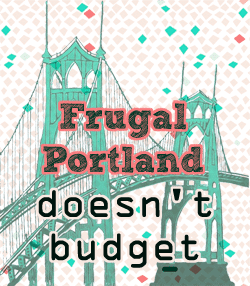 My usual corner of the internet is frugalportland.com. Today, I want to talk to you about why having a budget may not be the most important thing on earth, and how it’s entirely possible to achieve your financial goals without one. Simply put, a budget is the outcome of evaluating your spending, and setting limits in different categories. Tracking your spending is important, to be sure, and if you don’t want to do it yourself, well, that’s what Mint.com is for. Keeping a budget made me fret and worry. Those of you who have ever fretted and worried know as well as I do that nothing good can come from these.I mean, no one ever worried their way toward financial independence. So I tossed it. I figured, hey, I have some fixed costs — rent, car payment, car insurance, and student loan payment — so why budget for those? Instead, I could write a real number down. I don’t have to “stick to my rent budget” because nothing ever changes from month to month, unless I move. So, once I figured out my fixed costs, and figured out my savings goals, the rest went to bills. I am a loyal and avid supporter of Mint, but I do not find their budget section useful. The section I turn to, after categorizing all my transactions (and you should use a credit card unless you carry a balance, because it’s much easier to track!) is goals. I have several goals going: pay off student loans, pay off car, save x dollars in an emergency fund, save for retirement. Mint sets them up so that they tell you when you’ll achieve those goals, and if you’re ahead or behind. To me, this is MUCH more effective than, “hey, last month you spent $78 more on groceries than you budget for” though I can’t figure out how to turn those alerts off. I’m not positive that my no-budget solution will work for everyone, but I think that figuring out your fixed costs and automating your bill payments frees up a lot of space in your mind. And that space can be used to figure out a way to make more money, which will help you achieve your goals much more quickly than worrying about every cup of coffee you buy. Do you follow a budget? Does it work for you? For me, I’d be lost without a budget, and I attribute our modest financial success so far in life to putting the time in to create a budget each year since 1998. A budget for me is not about forecasting expenses and then cracking the whip when I spend too much. It’s about making better money choices over time. Our budget reflects our short, medium, and long term goals. Without these, I’d have no idea how to answer the simple and fundamental question, Can we afford this? (while contemplating a vacation, new car, or more costly home). I fear many answer the question by taking a peek at their bank account or cash flow–if there’s “extra,” then yes we can afford it! With that approach, meeting one’s goals will be purely a matter of chance. Kurt, to me it doesn’t sound like you budget, it sounds like you save for goals — do you use Mint? Short, medium, long term goals are in their goal section, not their budgets. Maybe it’s just a matter of semantics. I’m with Kurt, I would be lost without a budget as well. We’ve budgeted for years and it has reduced a ton of stress and anxiety for us. It’s so peaceful to actually know how much you can spend without having to worry about whether or not you can cover the remainder of your fixed bills. We could probably go without a budget now, but we’d still be using our cash limits we’ve placed on “discretionary” spending items. Therefore, we’d still be budgeting, just without using excel. We, also, have a budget that we sorta follow. It basically helps me get an idea of what we can or cannot spend. I take a portion of my check into savings, which usually doesn’t get spent, unless it’s a necessary, big ticket item. As long as we don’t go over. We are good. I try to analyze what we spend on, although I know already….food. Touche — it’s food for me too. But that’s okay. I have to eat every day, or I turn into a MONSTER. I knew you’d find me hiding over here, Jacob! 🙂 I guess my point is, if I’m saving enough and putting enough money toward my goals, then it isn’t worth stressing about whether I should buy the $4 or the $7 cheese at the grocery store, or “wait until next month” to replace my vacuum filter. If you’re good at keeping your expenses in line and find you spend roughly the same amount month after month I think it could work. I have a rough budget but never overspend it so it isn’t a big deal to me whether or not I have one. I’d still make the same financial decisions. Agreed — and to me it’s silly to budget for the constant costs — rent, utilities, etc — just pay them, don’t budget for them. I like budgeting, but its a new things for me, and it took a long time to get here. I keep a barebones budget to help make sure that the basics are covered. Ps. Hi! Glad to have you here! I take your points here concerning your fixed expenses and goals, but you haven’t addressed discretionary spending at all, which is where budgeting actually comes into use. If you don’t care how you allocate your discretionary spending and you stop spending when you reach the end of your money, then hey, you just have a budget with one line: discretionary spending. I guess most of us who do budget (or budgeting plus short-term targeted savings, like we do) enjoy some more accountability – or, conversely, freedom – to keep us balanced. You’re so right, Emily — I do just have one lump of discretionary spending! But I do have short-term savings, I just don’t consider them a budget. Rather, they are automated to be transferred from checking to savings the day after my paycheck gets deposited. Some of it is semantics, I agree. Sometimes a budget is not everyone. But you do need to have an understanding of where your money is going and why you make the purchases or payments that you make–gain a better insight of your spending habits. As long as you have some type of tracking method and are automating your savings/investment contributions (and increasing the percentage bit by bit)you should be fine without a budget. I have saving goals set up specficially for spending, such as vacations and shopping—more like my splurge account. Everyone is different. Some people enjoy the structure of budgets and others feel like it constrains them…and there’s a reason for it, but I will spare you the psychology behind that for now. Agree wholeheartedly that tracking spending is exceedingly important and that we’re all different when it comes to budgets. I think if you like them, great, but if not, there’s another way. We’re all on the same path. Kathleen – I couldn’t agree more with your assessment of Mint’s budgeting tool. You could say the same for PNC Virtual Wallet and all of the other category-based budgeting solutions. It is senseless to track spending in all of these areas. Where I’ve found that most folks can gain benefit from budgeting is in creating a 12-month budget forecast that accounts for bills and occasions (holidays, major shopping trips, vacations, etc. ), then focuses their attention on what we call ‘weekly walking around expenses’. By having a budget forecast that accounts for the bulk of your spending from bills and occasions, you can quickly understand what you have left to spend on a weekly basis for all of the other stuff you need.